Extruded cables are light and easy to handle and extruded cable systems are designed to be maintenance-free. Dependent on the system requirements, these features present significant benefits in terms of total installed system cost. Prysmian produces extruded cables with either XLPE or EPR insulation material, using design and process technologies, which ensure continued service reliability and long-term performance. Such cables can operate at elevated temperatures and under considerable electrical stress. • Outdoor terminations with porcelain or composite insulators. 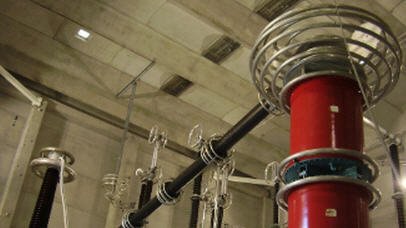 • SF6 and oil immersed cable terminations (both dry and wet designs). • Pre-moulded joints suitable for all installation environments and all cable designs. • CLICK-FIT® joints for factory-prepared cable heads and asymmetrical jointing. • Further installation materials (cable cleats, earthing leads, etc.). • Transition joints for interfacing extruded cable systems with both fluid filled and gas pressure systems. Prysmian also provides innovative cable solutions, for example the Air BagTM cable system, which optimise all stages of the system design, installation and services and provide considerable potential for reducing the overall system cost. In order to meet different standards and preconditions we always tailor-make the cable systems in this area. Please contact our experts to specify your requirements. In addition you can read about cases where we have delivered customised cable solutions.